Bassam Al-Sabah, Illusions of Love Dyed by Sunset, Ground floor gallery from the outside. Photo credit: Peter Varga. Bassam Al-Sabah, Time, be Still, digital print on bamboo fabric, 2018. Photo credit: Peter Varga. Bassam Al-Sabah, Longing Beyond, CGI Video, 1 minute 36 seconds, 2018. Photo credit: Peter Varga. Bassam Al-Sabah, Hallucinations of Locality and Sameness, Oil paint on Perspex, 2018. Photo credit: Peter Varga. Bassam Al-Sabah, Expansion Pack, Holographic leather, expanding foam, pyrite, paint, pigment, 2018. Photo credit: Peter Varga. Bassam Al-Sabah, Fenced Within the Silent Cold Walls, CGI film, 12 minutes 24 seconds, 2018. 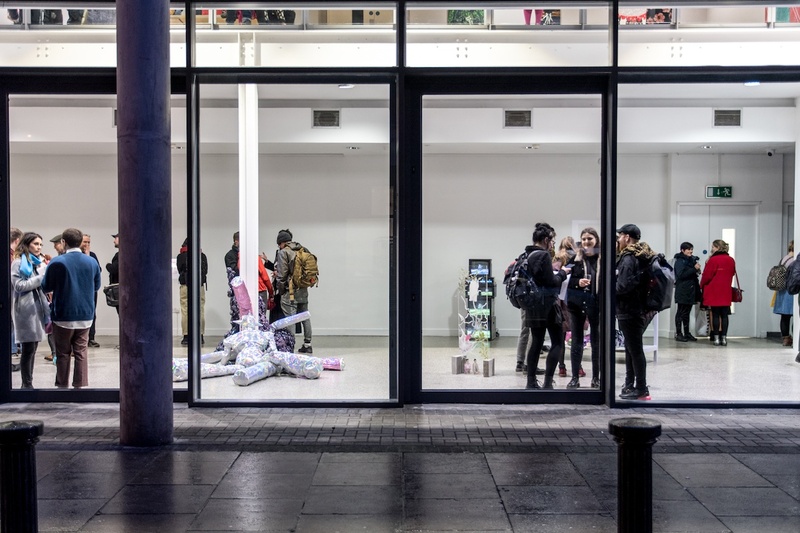 The silver sprawl of a robot’s body through the gallery window appears as invitation to something light and playful. 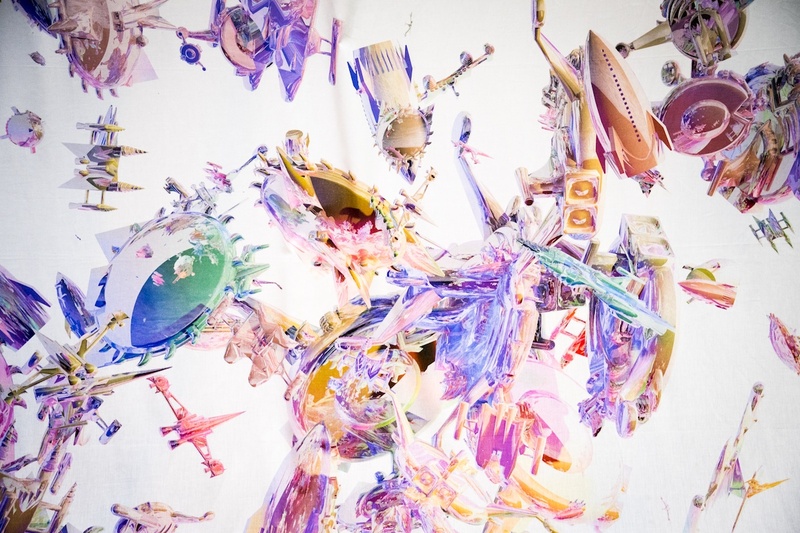 In the cube space, a long roll of fabric pours down a wall, printed with spaceships and alien worlds in soft pastel tones, mint greens and lavenders, reminiscent of a child’s duvet cover. Ships both approach and tumble away from varying perspectives, so that we are both above and underneath the action, in endless repetition. It is uncertain if the ships are attacking or fleeing the worlds in which they are further reflected. In the corner of the window on the floor are roughly hewn clay flowers. Slightly alien in appearance, they twist in an undulating jungle of forms towards the light. I’m here to see Bassam Al-Sabah’s Illusions of Love Dyed by Sunset, an exhibition that takes the subject of exile and loss, in particular that of the artist and his family’s exile from their homeland in Iraq and the violence of the conflicts they suffered through, including the Iraq War. Al-Sabah draws on family photographs as well as the Japanese anime series ‘Grendizer’ featuring a super-robot, which was available as popular entertainment on Iraqi television, and a childhood hero to Al-Sabah. In the main gallery are many works, too many to describe entirely here, varying in medium from simple animation to sculpture, often with a kind of lo-fi aesthetic. 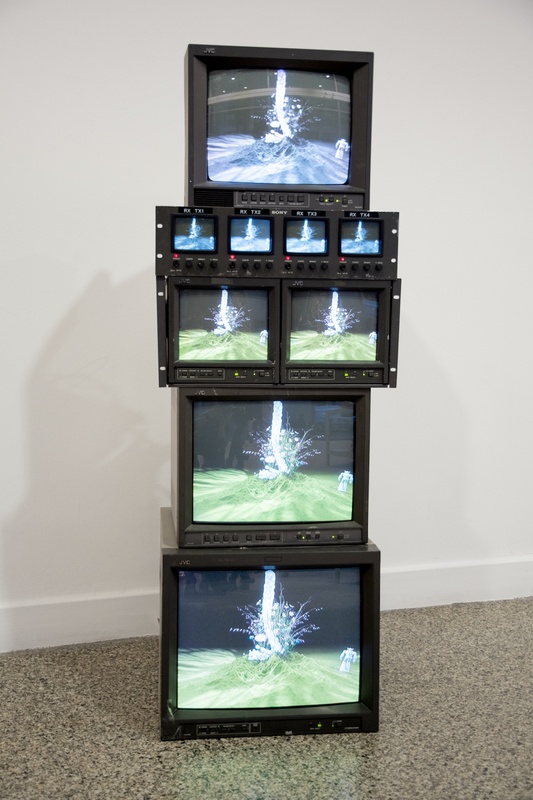 One stack of JVC screens shows a revolving red square of water rippling in a black space on which a green island floats, glossy and vibrant. Slowly, white flowers grow out of the earth, and then shiny cylindrical robots fall from the sky and disintegrate, fragment, dissolve, deflate and melt away. On another set of monitors a robot figure circumnavigates a green hill, onto which bubbling white liquid continuously pours. Grasses and flowers grow until eventually the flow stops and the plants dissolve and disappear. In the retelling these narratives have a dream-like feel. A series of paintings on glass are set simply into blocks on the floor in various locations in the gallery. They depict figures painted from family photographs accompanied by plantlife, but disturbed by cartoonesque explosions. In one painting a man and boy on rollerblades stare happily at the camera but are catapulted strangely through swirling blue forces, on the other side a young girl with her arm around a younger boy is menaced by the same eruptions. Writing on the glass says ‘ah my land that was so green’. There are more small portraits set in resin on a simple white shelf at the side of the gallery, like family knicknacks. On closer inspection the warnings written inside are at violent odds with the soft colours and images, they include ‘Beware of coming tragedy’ and ‘Listen! Dream beyond horizon. Because there is nothing here’. 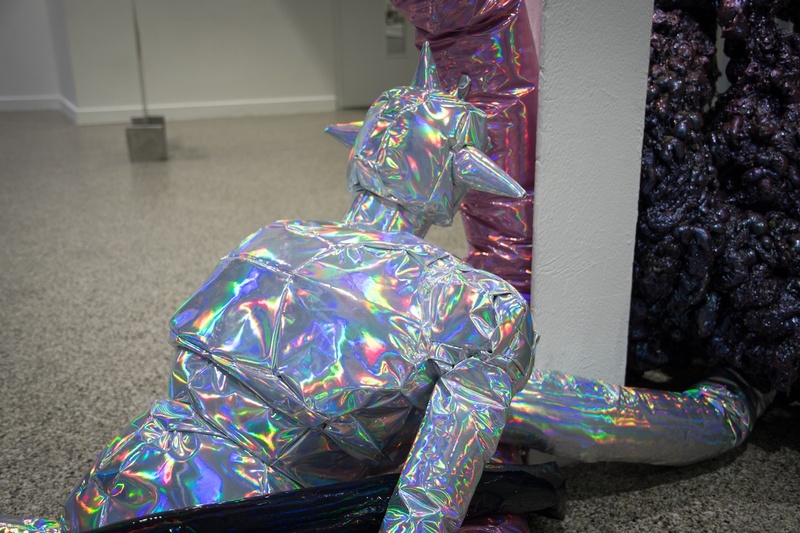 In the centre of the gallery, lying in a spectacularly deflated manner are the fallen robots, their iridescent fabric reflecting multiple spectra in amongst fragmented limbs they exhibit something defeated. Behind them a molten black and purple growth appears to be consuming some of the extra limbs, in sinister contrast to all that floppy shininess. Here it seems as though the robot, a once powerful childhood hero, has collapsed impotently when brought to a more human scale, when asked to perform outside of its fictional world of perhaps simpler conflicts. Another fragmented clay robot lies on a table nearby like a recently exhumed artefact, cracked and fragile. All the time the works in the gallery are infected by the swells of the audio accompanying the film work in the back room, which range in tone from melancholic to foreboding. 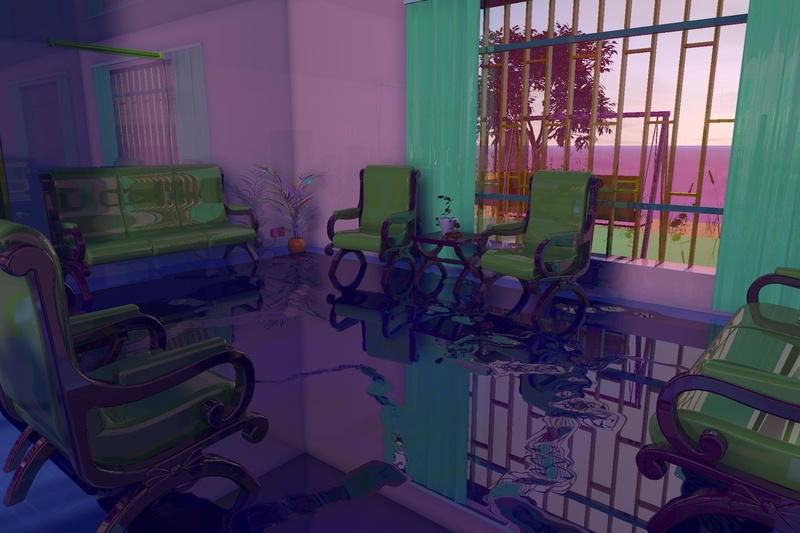 In this CGI film, a rendition from memory of Al-Sabah’s abandoned home in Iraq, we are drawn through various empty though furnished rooms, as though playing a video game. 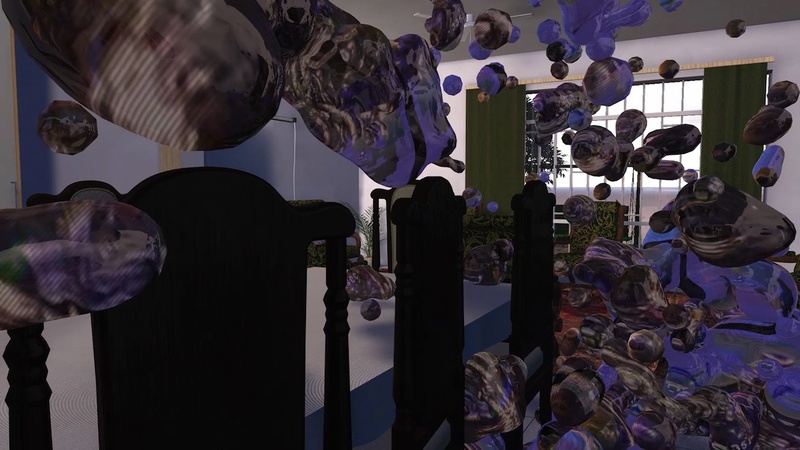 The rooms seem static and quiet at first, until worm-like shapes and blobs, full of flickering digital distortion erupt from radios and televisions, overwhelm the rooms and the screen we are watching. We can’t help be reminded of watching far away conflicts on TV from the comfort of our own sitting rooms, here the same forces surge out in utter destruction, invading the domestic realm without restraint. 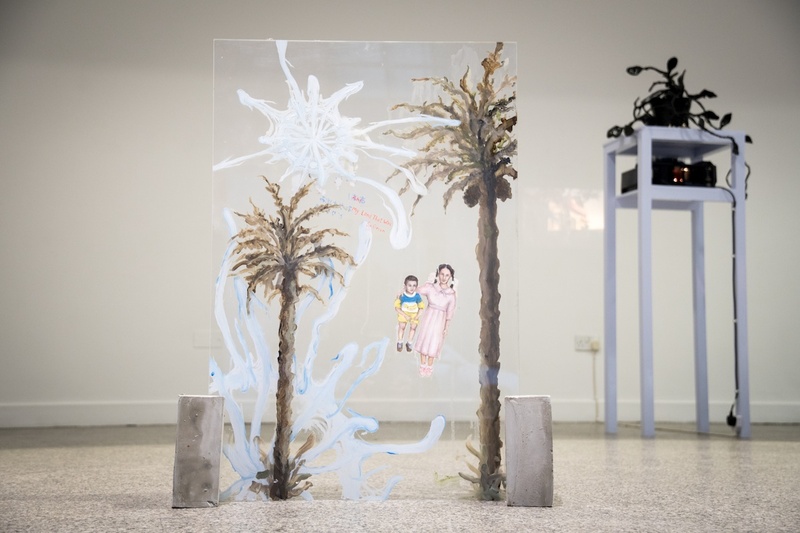 A voice introduces itself as that of the artist’s grandmother who discusses the family’s departure from Iraq, leaving her only with photographs as memories, which, paining her, she burns, their charred ashes depicted as colourful fragments rising from a fire. This destruction of images forms the emotional zenith of the show, as though this destroying of any illusion of normality and the past is all that is possible in an anguished present. Likewise the glass paintings take the photographic subjects and place them into landscapes of danger, removing them from the safe borders the photographs once provided but which failed to protect them from what the future wrought. The texts written on the paintings serve as warnings come too late, or else admonishments of futility. There is a challenge to the totemic authority and aura of the photograph, no place for the comfort of any simple nostalgia. So too our childhood heroes cannot save us, and those that are sworn to protect, from family to state, often fail us, a fate that, sadly, some in this world suffer more than others, a message that is apt for our times. Al-Sabah’s work seems to be an oncoming process of re-staging and a not quite yet cathartic burial of the past. There is a hint amongst the work of a longing for green and regeneration through the ongoing appearance of plantlife, a subtle underlying theme winding through the show. Suzanne Walsh is an artist and writer from Wexford, based in Dublin.